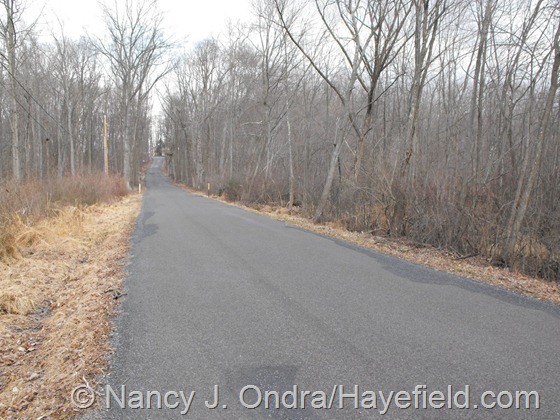 For the most part, March isn’t an exciting time for Hayefield and its environs – color-wise, at least. The first subtle signs of spring in the neighborhood usually appear the the nearby woods. 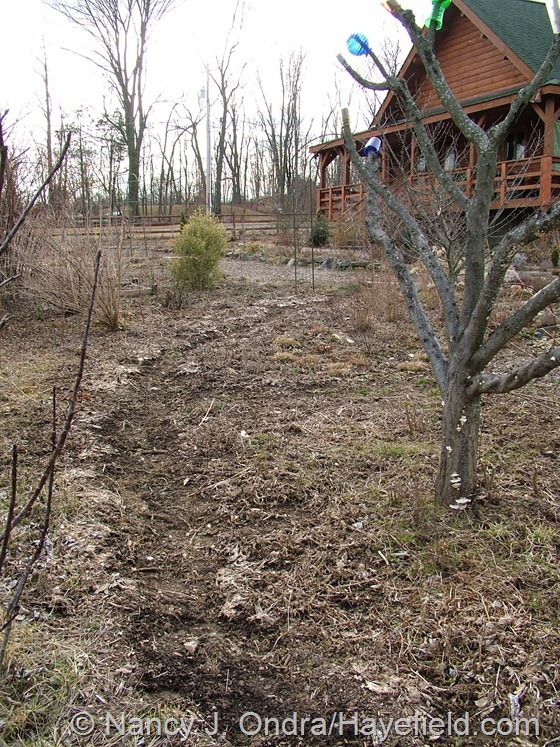 That looks like a rather clinical approach to maple sugaring, doesn’t it? 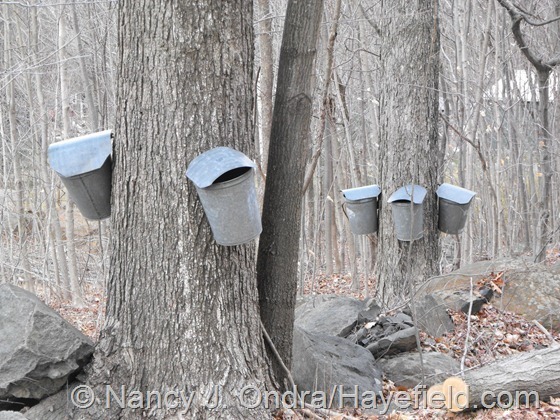 I suppose it’s a bit more sanitary than these open metal buckets, but its nowhere near as picturesque. I think the two different styles belong to different neighbors. 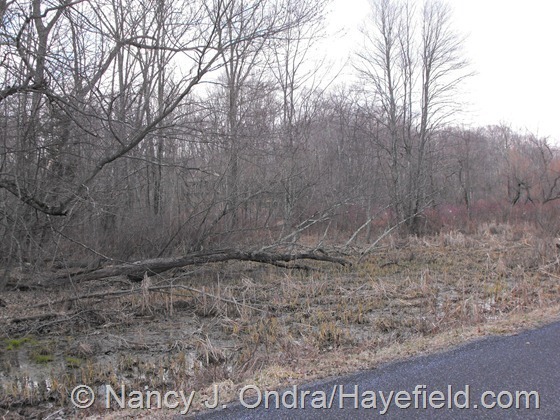 The clinical ones show up in the woods in a beautiful bit of wetland that’s barely a quarter mile from here, a 5-acre parcel of land that is part of the headwaters of the Hazelbach Creek, and that is permanently protected from development. 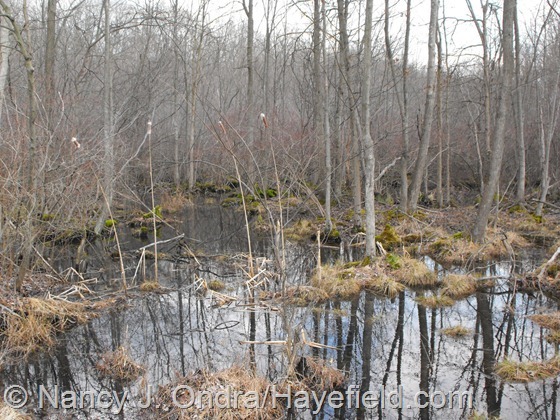 The swampy part is known as Peeper Pond, and the reason for that is deafeningly obvious this time of year. 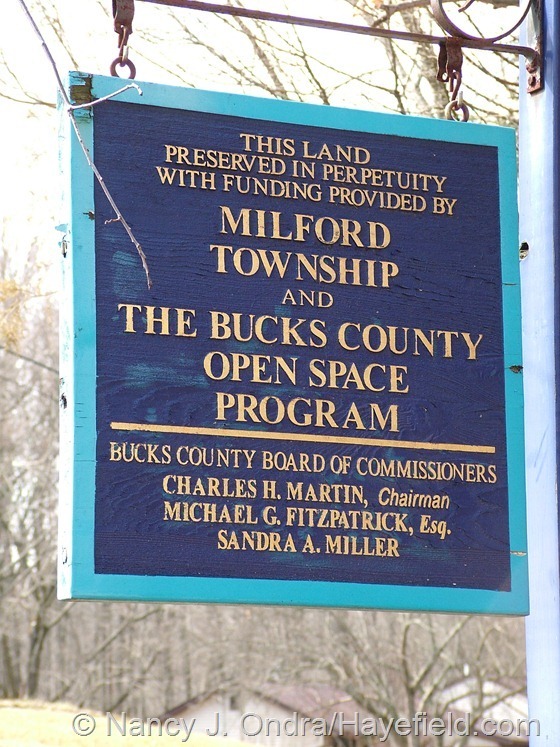 I grabbed a bit of video with sound (it’s on YouTube at Peeper Pond ~ Milford Township, PA), but as the frogs hush quickly when they know people are walking around or when cars drive by, it’s hard to get the full effect of how amazingly loud they can get. Besides the high-pitched peepers, there are loads of other frogs chirping and clucking and otherwise making quite a racket. Though there’s plenty of water in there now, yellow flag iris (Iris pseudacorus) has taken over the open part by the road, so there’s hardly any standing water by July. I guess that’s enough for the frogs to breed there, though. 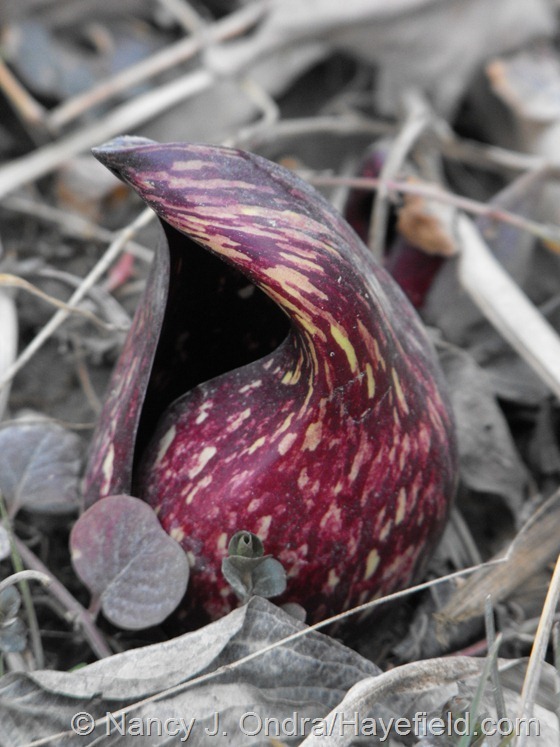 It’s also enough for the very earliest bloomer in the neighborhood: skunk cabbage (Symplocarpus foetidus). Another quarter mile along, past the metal sap buckets, the road cuts through another, wetter bit of wetland. The frogs sing here too in spring, and later on, there’s lots of buttonbush (Cephalanthus occidentalis) and winterberry (Ilex verticillata) to look at. So anyway, when I moan about how wet the soil is around here in winter and spring, I’m not kidding. 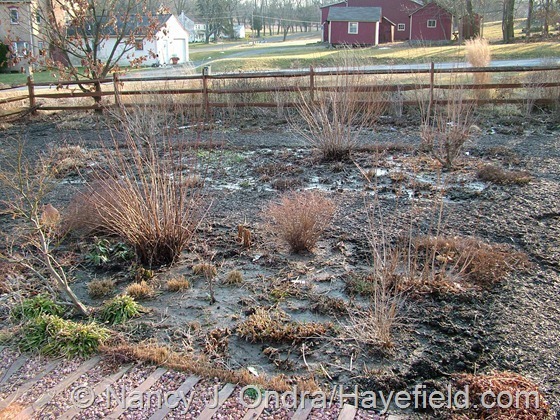 I don’t have enough water for frogs, thank goodness, but the soil tends to be seriously soggy from the time the ground thaws in late February until early to mid-April. …and are just about done by March 15th. The leaves of the snowdrops (Galanthus) have been up since mid-January, but they didn’t really open until about a week ago. ‘Golden Starlet’ winter heath (Erica carnea) started flowering last October, so I’m not sure whether to count it as a late bloomer or an early bloomer. 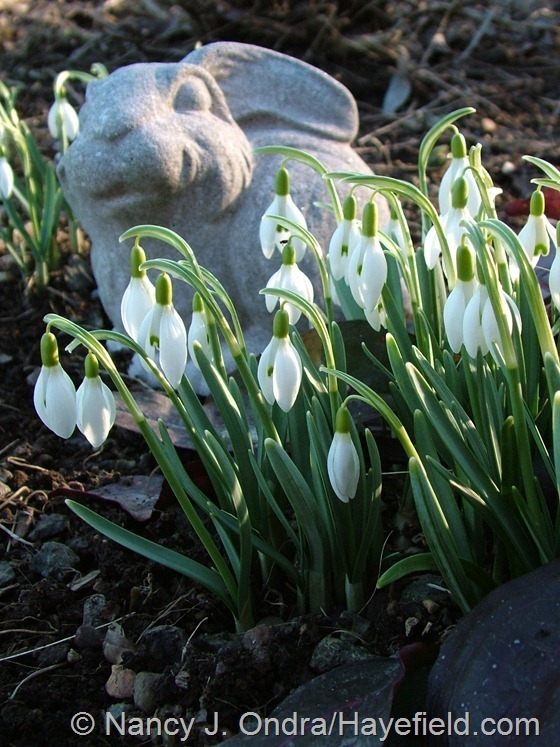 The ‘Snow Bunting’ crocuses, though, are definitely early, opening fully just a few days ago. 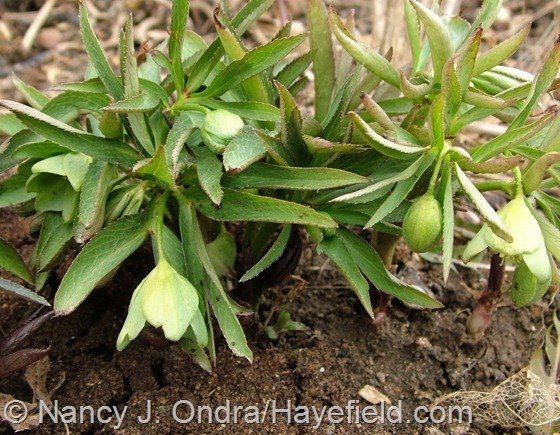 Helleborus dumetorum is the earliest hellebore to bloom here, but it’s pretty subtle. The showier Lenten roses (Helleborus x hybridus) on the south side of the house just started to open. Most will wait for another week or so: too late for the March Bloom Day. As you may have noticed in some of the other pictures, I’ve started bringing some of my garden ornaments back outside for the season. 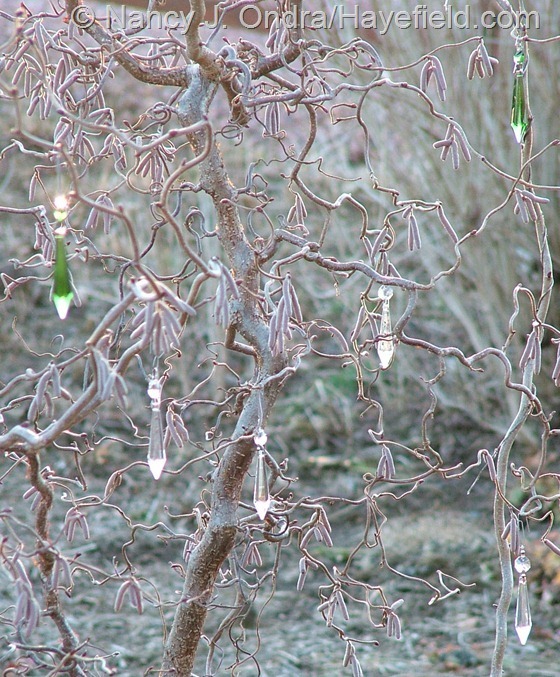 And now, it’s about time to remove the crystal drops that have decorated the contorted hazel outside my office window for the past few months, since its own catkins are taking over the show. I’ve enjoyed watching these sparkle on sunny winter afternoons. I can’t take credit for the idea; that goes to my friend Jackie. You know how some people have a knack for having interesting adventures? She is one of them. In this case, she found an old cardboard box in a parking lot and discovered that it was full of antique chandelier parts. Despite her efforts to find the owner, they were never claimed, so she used them to decorate her golden elm tree and sent me a picture. I thought it was so terrific that I immediately ordered some cheap modern glass drops to recreate the effect here. I also took advantage of a few dry days this week to plant out some of the bulbs I had stored in the basement for the winter. A few years ago, I would have said it was crazy to plant cannas and dahlias in March around here. But I took a chance around this time last year, and the plants grew so much more vigorously and bloomed so much earlier than after the usual May planting that I thought it was worth trying again. I’ve heard stories of these bulbs overwintering outdoors in the Philadelphia area, so I figure they should be all right in cool but non-frozen soil for a few weeks, since they haven’t started growing much. 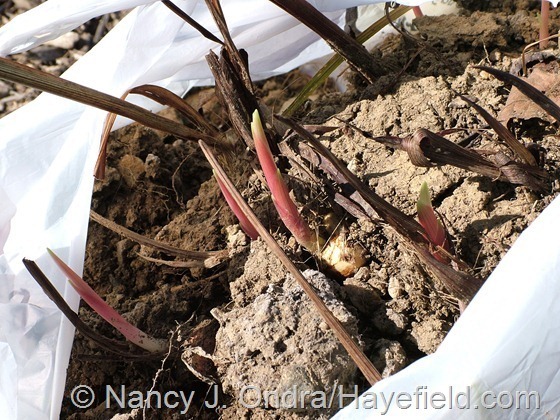 Just look at these rhizomes of Canna indica ‘Purpurea’. The ‘Oakhurst’ pineapple lily (Eucomis comosa, above) is just barely starting to grow, while the ‘Lucifer’ crocosmias (below) are definitely shooting up. In years where I’ve waited until after the last frost date to plant, both of these have been very unhappy sitting in the basement. 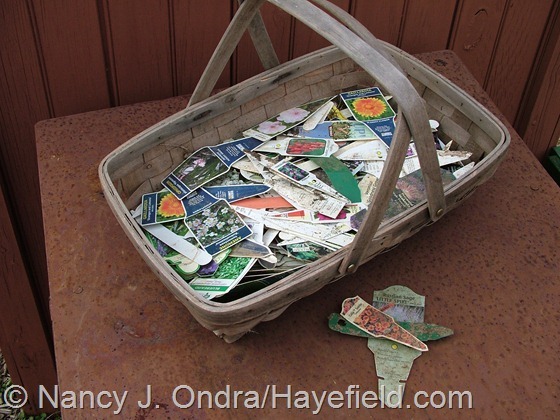 …over a hundred plastic labels from now-gone annuals and perennials. Some of them were from things that I don’t even remember planting. And one was from a perennial that I know died at least 6 years ago. Well, it’s a relief to not have them littering the garden now. 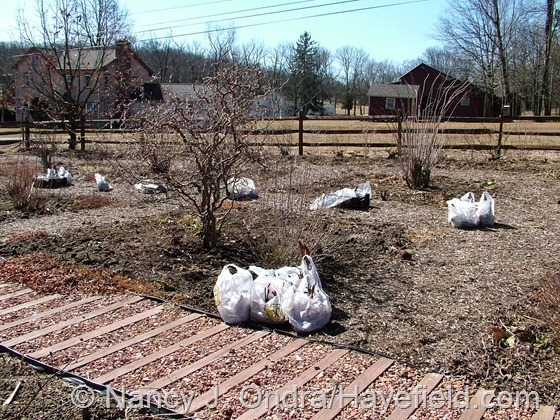 The front garden is all tidy and pruned and ready for spring, and the side’s just about done too. 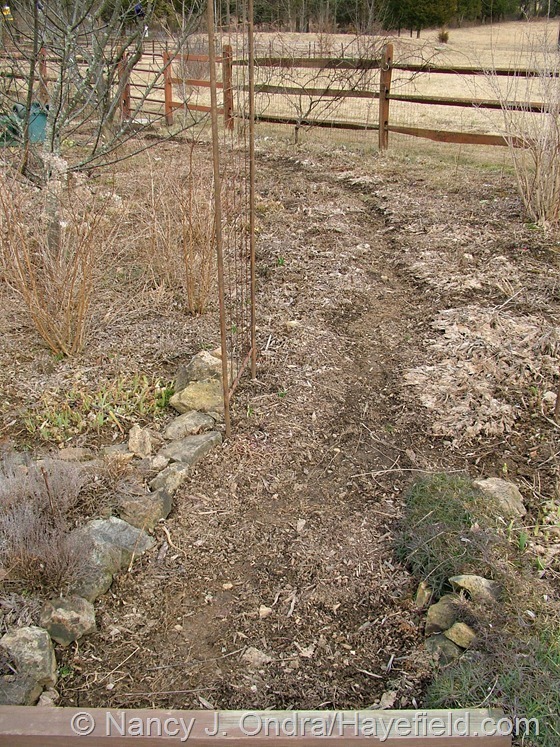 The back is my next area to tackle, including this problem path. 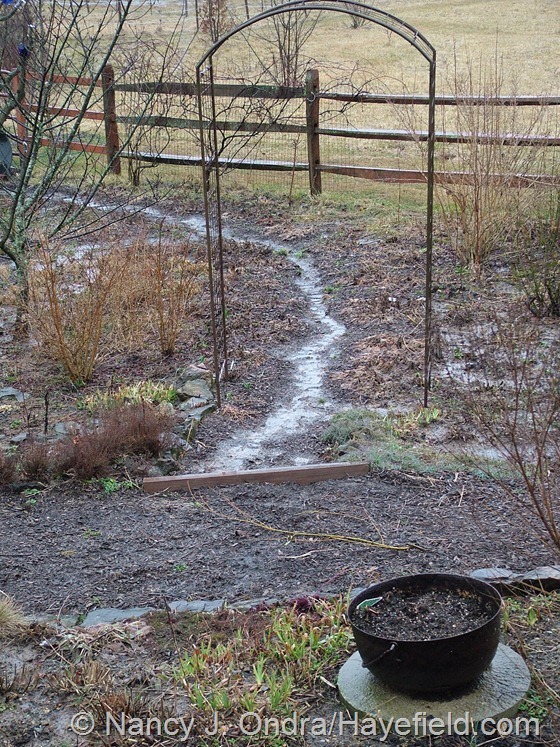 For some reason, it washed out badly this winter, so it becomes a small stream every time it rains. 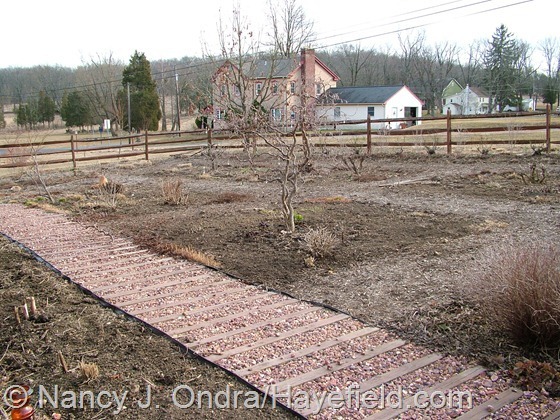 My gardening budget doesn’t allow for purchased paving this year, and I’ve used all the native flat rocks I have access to for other areas, so I decided to experiment with something I have a lot of: alpaca fleece. No Duncan, I’m not going to shear you and Daniel quite yet; it’s still too chilly for that. I have a huge sack of your fleece left from last year, and it smells a bit mouse-y because I left it in the barn too long, so I may as well use it in the garden. I remembered seeing a picture of a path made out of wool in an old issue of Gardens Illustrated, and I thought I’d give it a try. Granted , it’s not a natural-looking pathway, but it has a wonderful feature I hadn’t even considered prior to spreading the fleece. 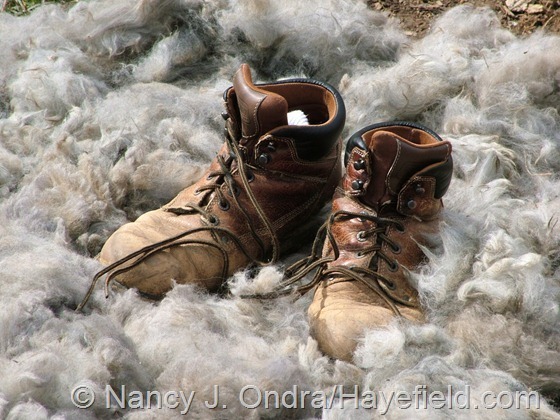 As soon as I was done, I had the irresistible urge to take off my boots and walk on the fleece. And oh my, it was so amazingly soft, you can’t even imagine! Nothing less than this would ever entice me to go barefoot in March. Thank you, boys! Well, that was fun for a March Bloom Day, even with minimal blooms. For now, most of the color has to come from the sunrises, but there should be more flowers by next month. 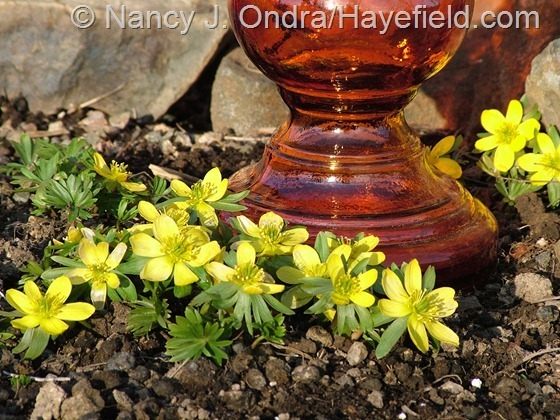 To see what’s going on today in other gardens all around the world, check out Carol’s Garden Bloggers’ Bloom Day post at May Dreams Gardens. 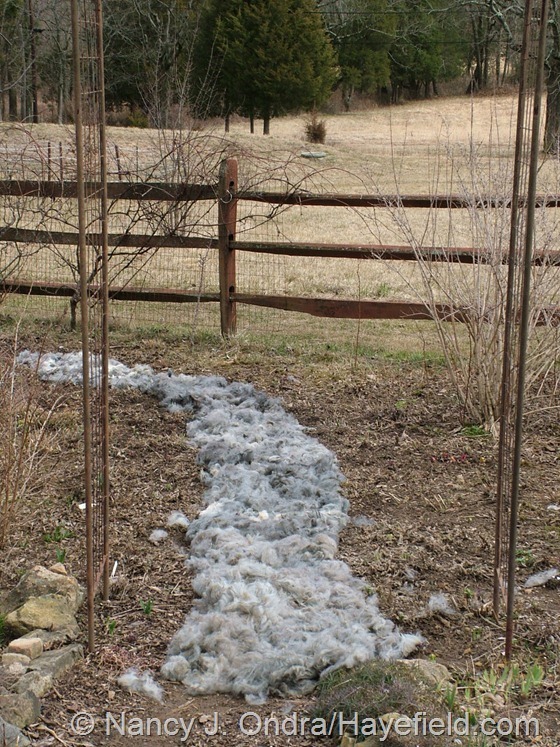 A friend of mine had sheep at one time and she used their wool as path coverings. I don’t remember how she liked it over all. Happy GBBD. It probably won’t last long, but I’m hoping it will stop the erosion until I can find a more permanent solution. I think Hayefield looks wonderfully exciting! We are under snow yet in Northern Wisconsin this time of year. 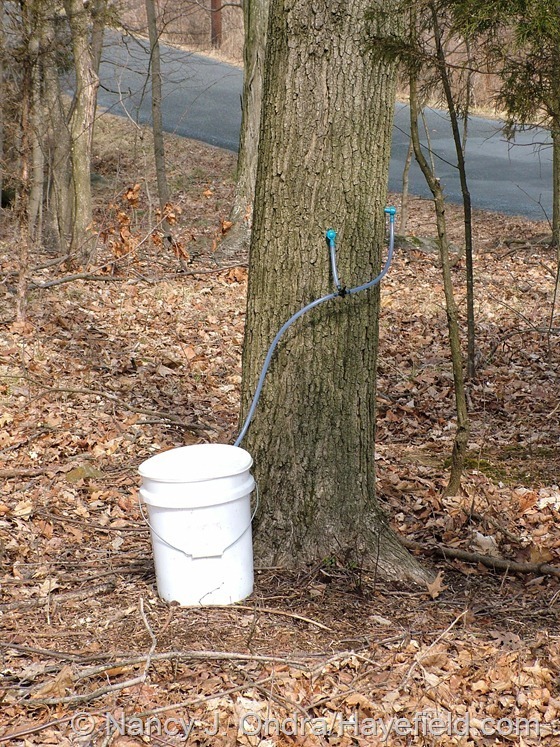 Our maple trees are tapped too, but the daytime temps aren’t cooperating. Love the new trail of wool! Snow still? I’m so sorry, Julie. We got off very easy around here: less than a foot for the whole winter. I hope yours melts soon so you can start enjoying your garden – and taking more pictures for your beautiful notecards too. Thanks for the smile this morning Nan! Just thought I’d tell you the amsonia hubertii seeds and the White Africian Foxglove seeds are up 1/4 inch! Exciting! Great news about the seeds, Sue. 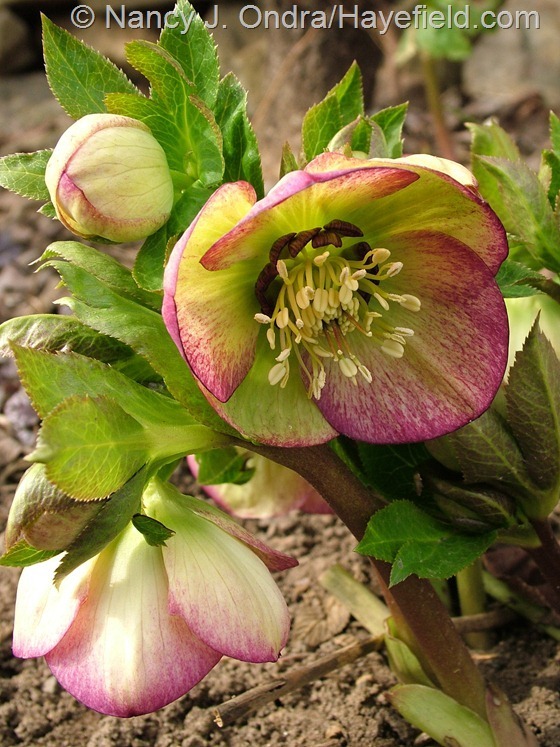 And the hellebore photo you sent was gorgeous; thank you. H. niger won’t grow for me, but yours obviously loves you! What a very interesting post – I really enjoyed it. 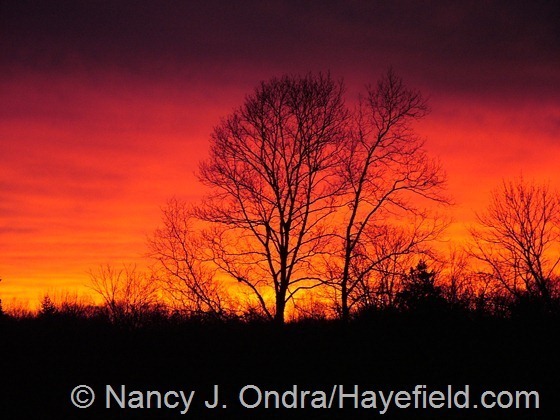 You covered so many topics and ended with a beautiful sunrise! Thanks for stopping by, Lea – and Happy Bloom Day to you too! 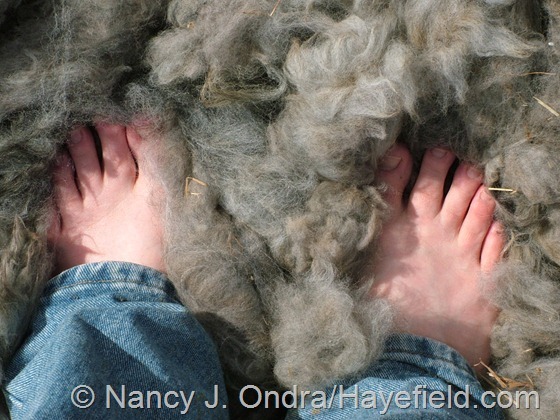 I love feet photos and the fleece idea is great. Thanks for sharing the rawness of your garden. “Raw” is a good word, Laura, for both the look and the temperature. I hope your part of the world is milder on this spring morning. Nancy, I’m intrigued by your planting the cannas and such in March! Do you actually put them in the ground now or just bring them outside? Have you tried it with calocasias and alocasias? Hi Lorraine! I actually planted them in the ground. 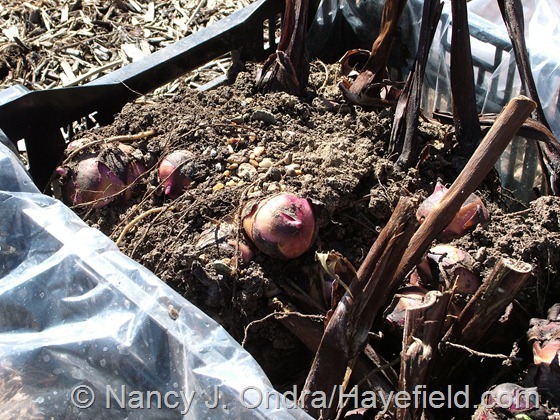 At the time I made the decision, the forecast wasn’t predicting that we’d get so cold again at night, but I think only the top 1/2 to 1 inch of soil is frozen again, and the bulbs are below that, so they should be fine. If I lose the gamble, I’ll report back in a summer Bloom Day post. 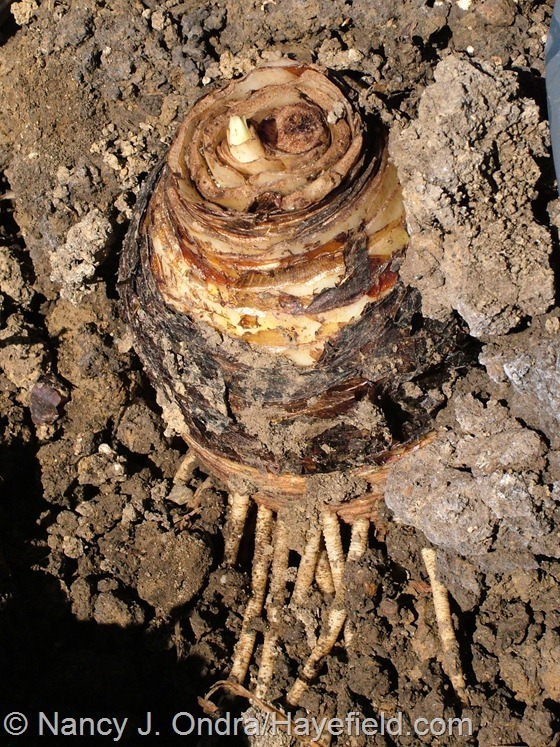 I figure that cannas, dahlias, eucomis, and crocosmias should be ok, but no, I definitely wouldn’t try it with Colocasia or Alocasia; I’m pretty sure they would not take kindly to this treatment. Thank you. Just what I needed. Made me smile. I love the crystal drop idea! I also came across some a few years ago and use as Christmas tree ornaments. I now know not to store after Christmas nest season. I live in western PA and leave my croco ‘Lucifer’ in the ground and it survives. I also like the idea of planting dahlias directly in the ground early. Thanks for the first-hand info on your crocosmia, Greg – that’s good to know. And how fun if you could get double-duty from your crystal drops. I’m trying very hard to not get carried away with the bling, but I’m finding it difficult: there are some really beautiful shapes and colors out there. Who knew that there was such a market for chandelier parts? I forgot to comment on the fleece path. The birds in your area will have the softest nests ever! LOL. Oh yes they do, Greg. I found a number of super-fluffy creations when I cleaned out the nesting boxes a few weeks ago, from the fleece I scattered in the meadow last year. I’d suggest sticking with your usual approach for now, Sue, because it’s possible I just got lucky last year. I will be reporting back on my results later on this season. If you don’t see any canna, dahlia, or pineapple lily foliage in my June Bloom Day post, you’ll know that I made a serious tactical error. Nan, your garden stories are wonderful — even during this quiet season. Love the crystal ornaments and the fleece path. Great idea about planting cannas now too! Thanks, Rob! We’ll see how the fleece path holds up – but really, the barefoot bliss I’ve already enjoyed has made it worth the few minutes it took to spread the fiber. I enjoyed seeing your garden structure without the plants grown up. The fleece does look snuggly on the toes. Before this, I thought that alpaca socks were the pinnacle of a luxury foot experience, but being immersed in the raw fleece is even better. Plus, it’s about as up-close and personal as I’ll ever get with the boys, as they don’t take kindly to cuddling. Happy Bloom Day to you, Shirley! I love being surprised in a garden and you always have a few surprises tucked up your sleeve. I love the alpaca as pathway material and the chandelier charms! It’s certainly a challenge to come up with something for these early Bloom Days, so I’m glad you enjoyed the surprises, Heather. The picture of your boots on the fleece made me laugh! I hope it works to stop the erosion. I’ve been harvesting tags as well this spring, although I don’t plant anywhere near as many annuals as you. 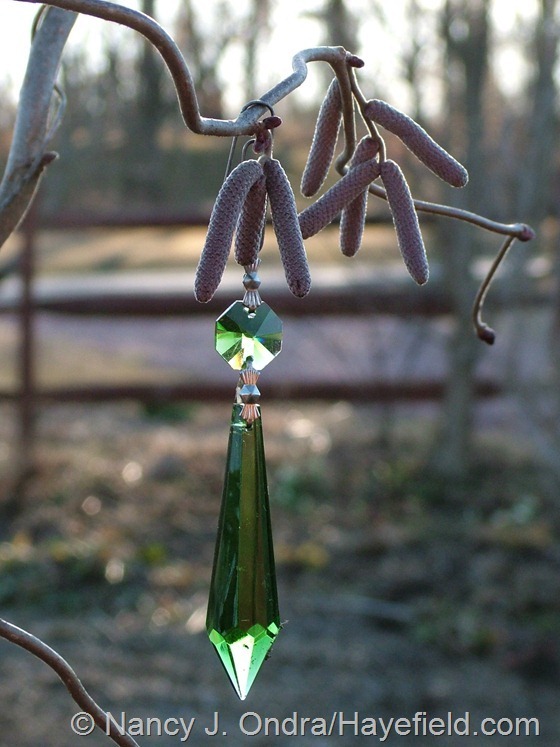 I love those crystal drops on the tree, I’m going to try that. I don’t think I realized how many garden ornaments you have, your photos usually concentrate more on the plants, I think. The crocuses with the blue bunny, that’s a really sweet shot. 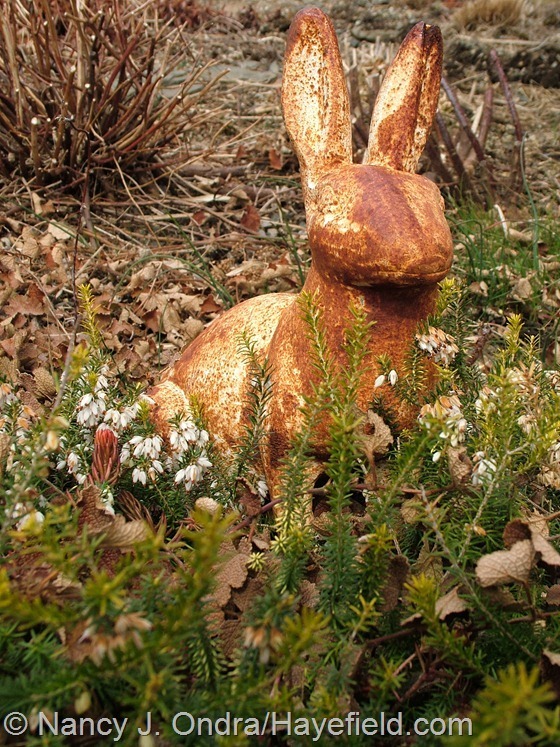 Looks as though your gardens are waking up… loved my walk with you this morning. Thanks for joining me, Carolyn. Should be a more interesting trip next time, weather permitting. I’m glad I’m not the only one who leaves orphaned plant tags around for years! The fleece was a big surprise — I can’t wait to see how this holds up. I may have to start collecting my dryer lint. Do a lot of laundry, Alan? Come to think of it, maybe a commercial laundry might be able to supply lint in quantity. Hmmm. Lucky for me, I get a new crop of fleece each year. I’m sure lots of alpaca people would be happy to find a home for their “seconds” and “thirds”: the fleece from the legs and tummy, and other sections that are too short for processing. I don’t have alpacas but I do have 3 cats! Come to think of it they could do with a spring shearing! LOL! The fleece looks like a great idea and fun for the toes! Hellebores have been up since early Feb here in middle TN. They bow their heads over when it freezes and then bob right back up when the temp rises again. The early daffs have now joined them and the jasminum nudiflorum (sp?) has been blooming for weeks. It has been a long cool spring all over as opposed to the big bang we all had last year when everything bloomed at once. It will be interesting to see how your bulbs fare and if the cannas come up ok. I leave mine in the ground all year and so far they have done well. I usually mulch them with leaves but this year I didn’t even bother with that. Looking forward to seeing what this year will bring to Hayefield! It’s always a feast for the eyes and food for the soul! Oh my – I don’t want to be responsible for animals being sheared specifically for garden purposes. Come to think of it, though, this would have been a great use for all the hair around when Mom and I had multiple Shelties. I could have covered the entire garden, I think! I’m pretty sure you’re Zone 7 where you are, so I’m not surprised that you can leave cannas out. I’m 6b by the last map, I think, and I can overwinter a lot more things now than I could even 10 years ago. Wow….. My feet are still in winter boots but from your photo I can feel the Alpaca fur between my toes! Ahhhhhh… Please come to my house with your ideas when you tire of Hayfield.. I need you… (I won’t hold my breath). Thank you for bringing on an intense spring fever! You don’t need me, Kate: you need great magazines and clever friends for inspiration. I wish you a wonderful growing season – and let’s hope it starts soon! In USDA Zone 5a South Dakota, your signs of spring are yet to be here. They will be appreciated as your photos show how you feel about spring. Would you believe that we’re back to being snow-covered here today? Definitely no more going barefoot for a while. Let’s hope that spring comes and stays for both of us, very soon! I love the color on that hellebore. 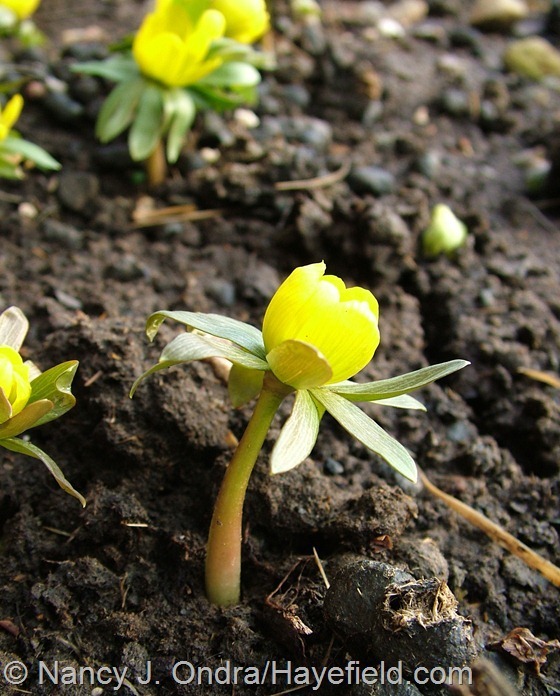 And your little bulb flowers remind me that I haven’t seen a trace of my winter aconite yet… hmm. Might have to go investigate and make sure they aren’t too covered with matted leaves or something. Some of the smaller bits did blow around, but much of the main part of the fleece clings together when it’s sheared off, so they stay in place pretty well. And yes, the snow is weighing it down today! I hope you’re able to find some spring things in your own garden very soon, Kim. Nearly 3 inches of snow in mid=March isn’t all that uncommon here, but it was certainly an unpleasant surprise, as you can imagine. And yes, my friend Jackie *is* very creative: hanging the crystals outside was a brilliant idea. Thank you for visiting, Jenni! You have peepers peeping already? You are quite a bit earlier than here. Well, not a peep out of our peepers since the day I took the video clip; the cold certainly puts a damper on their activity. I look forward to hearing them again soon, though I’m glad I don’t live right next to them. Happy Bloom Day, Kathy! I used to leave my dahlia tubers in the ground but finally lost most; I kind of gave up on them. Your clean-up is way ahead of mine, I keep getting out there, at least the weather has been nice. 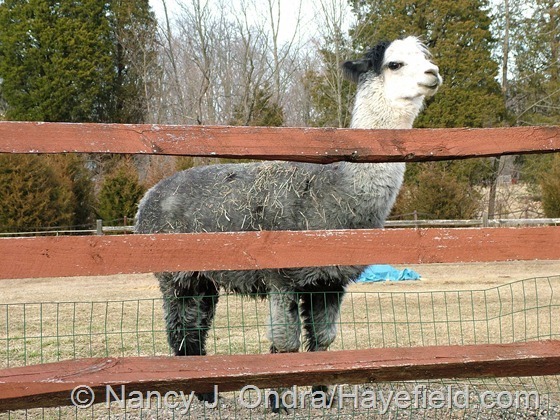 I was wondering what people did with their Alpaca wool. What an interesting idea. Yeah, we’re not that warm here yet, Hannah. I did leave a few expendable dahlias and cannas in the ground, and I think some of the cannas almost made it, but not enough for me to risk my really good ones. I suspect many alpaca people would be horrified at the idea of spreading the lovely fleece on the ground: it’s so wonderful for sweaters and scarves and other fiber arts. But as spinning fiber into yarn hasn’t yet risen to the top of my things-to-learn list, I’ve ended up finding other uses for it over the last 10 years. It’s really nice for pillow stuffing, too! I’ll watch your blog to see what you have to say about the dahlias you left outside, Dee. You’re in Zone 7a, I think, which isn’t all that different from here. If our long-range forecast had given any clue to the spell of cold, snowy weather we’re having now, I wouldn’t have risked planting so early, but it’s kind of too late to dig them up again, since I don’t remember where they are now! Thanks so much for the seeds you shared with me. I’d never heard of either of the okras before and can’t wait to see them in all their tall glory. Beautiful post, as usual! I was getting a bit depressed seeing Fran’s post for Fairegarden’s bloom day with all of the flowers that are blooming for her down south… it’s great to see I’m not the only area that’s just a bit behind. 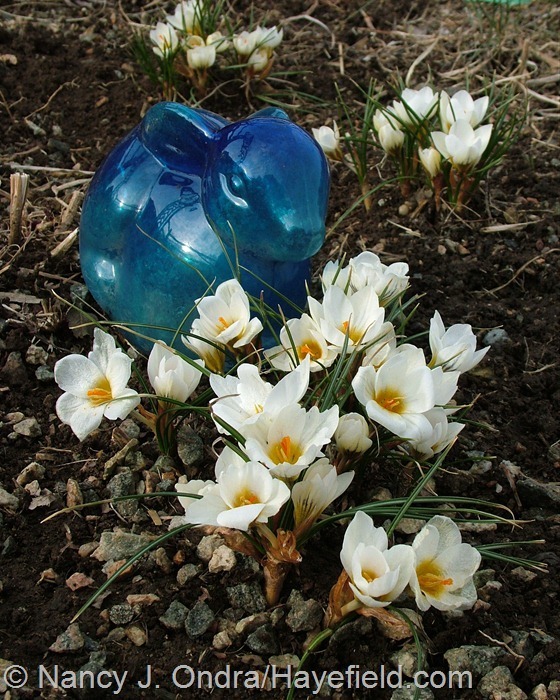 Note to self though – more crocus. Many, many more. And other spring ephemerals! Hearing about your seed success was a bright spot in an an otherwise dreary, snowy day, Donna. 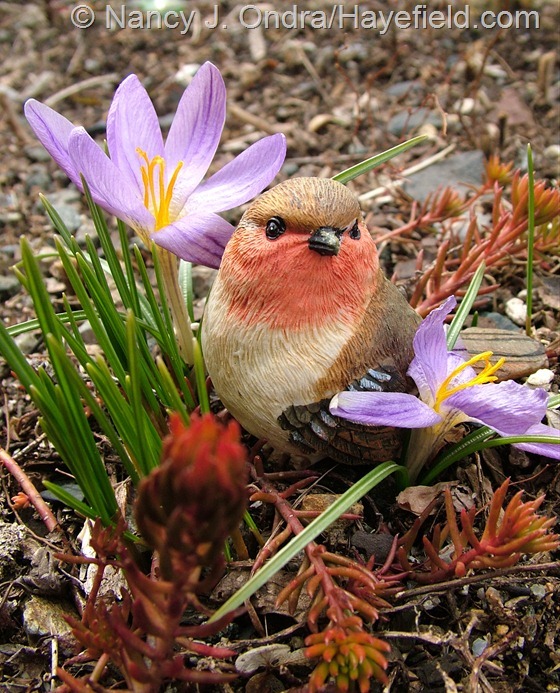 And I too should get lots more crocus – what a cheery sight they are. Come on, spring – Donna and I need you! I’ve read hair is good in the compost pile so your wool should add nutrients to the garden. I hadn’t thought of that, Carole, but you’re quite right: an organic nutrient source as well as a mulch. 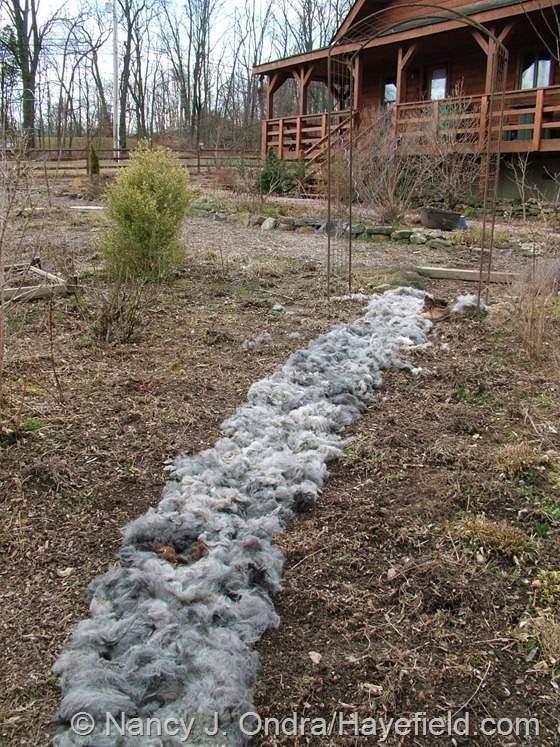 It will probably take a while, though: some of the fleece that I put out in the meadow for the birds a few years ago still looks as fresh as when I took if off the boys. 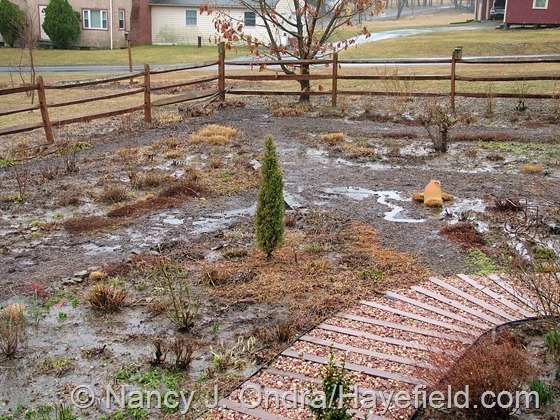 Wow…it looks like your ground is even more water-logged than mine! 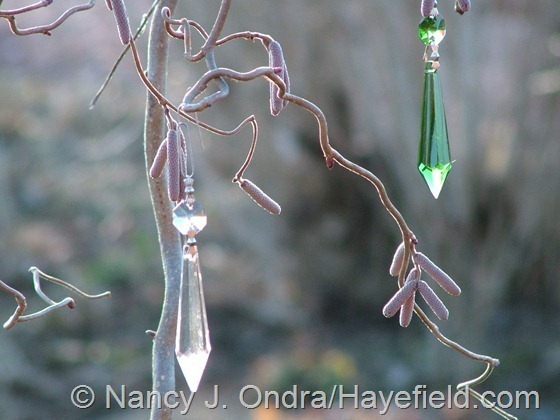 My garden is looking pretty bare at the moment too…but hey, the anticipation for what’s to come soon is sweet :-) Love the glass pendants, I may just steal that idea! Steal away, Scott – I did! Hope spring arrives for you soon. It’s still bloody cold here! How beautiful! Never thought about decorating the garden with crystals, amazing idea…just have to keep that in mind for the next winter season. Thanx for sharing the pictures! Hi there, Dabbie. Have fun with your own crystal decorating. My friend’s tree was even better than mine, because she had more and larger crystals, but even my few, cheap ones looked pretty good. They come in a variety of colors too, but the clear ones are the most sparkly. Thanks…..Soo looking forward to try it!